Looking for the perfect game day dip? If you are looking for a calorie-wise appetizer, this is not it but it is amazing and your guests will love it. 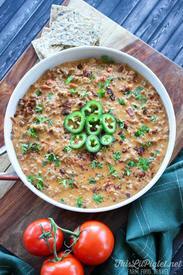 You can make this Bacon Cheeseburger Jalapeño Popper Dip as spicy or mild as you like. After-all, you are likely making it for a crowd and not everyone is a fan of foods so hot they make your eyes water. Either way you like it, Jalapeño Popper Dip is a warm cheese filled pot of delicious that will be hard to stop digging into once you start. In less than 30 minutes and only a few ingredients, you’ll have an appetizer ready to feed hungry guests. You’re welcome.